The 2016 Race Director Survey sheds a signiﬁcant light on the careers of race organizers, including the main challenges they face in the process of putting events together. For instance, 60% of race directors believe securing sponsors is their most significant event challenge. Furthermore, challenges don’t end at getting a once-off sponsorship, as no one wants to get stuck in an endless cycle of changing sponsors indefinitely! In other words, it’s not all about attracting sponsors – retaining them is just as, if not more, important. The most successful race directors know how to connect sponsors and participants not only during the race, but also before and after the event. This way, the partnership becomes truly lasting and meaningful, making sponsors want to work with such race directors again and again! In contrast, if the sponsors don’t feel like they are getting any value, and participants feel “sold to” and disengaged, something is obviously wrong, which is a hard pill to swallow after all the hard work! Fear not, as today we’d like to offer 5 helpful tips to secure and retain race sponsors. If you feel like you could use some help as a race director, keep reading! According to the 2016 Race Director Survey, 77% of race directors view social media as an effective marketing channel – and rightfully so! However, not all race directors bring the sponsors into social media conversations, which is a great opportunity to shine and stand out from the crowd. For example, why not poll your Facebook audience for their favourite product from the sponsor’s range? The sponsor can then reply to comments together with you, promoting their brand further and generating extra leads. This is a free, simple and elegant way to demonstrate support for your sponsors and introduce them to your followers! After all, sharing is caring. This approach creates an opportunity for your sponsor to engage with your audience pre-event, as well as keep the conversation going after the event is over, extending the value of their investment far beyond the actual race day. Let’s face it: it’s 2017, and event bags stuffed with coupons and products samples are getting old. People don’t want random stuff – they want something that they can use repeatedly, and sponsors will generate maximum leads from merchandise that brings joy, not frustration. For instance, have your heard of BibBoards, genius patent pending bib clips that runners are ditching NOT safe safety-pins for? Not only BibBoards are fun and easy to use, they are also basically billboards on bibs, as the flat exposed surface provides excellent estate for sponsor logos. Best part? 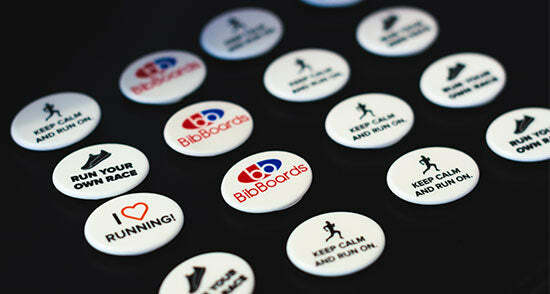 BibBoards are reusable, meaning that runners are likely to take these convenient bib clips to many future events. This is an unbelievable exposure opportunity that T-shirts and pens can’t really provide. Don’t forget to mention to your sponsors that over 17million runners cross a race finish line each year – and they will be sold on this desirable real estate opportunity, guaranteed. Think outside the box and try to offer unique opportunities for your sponsors – such as BibBoards discussed above! Make sure to brainstorm pre-race, race day, and post-race ideas to reach desirable outcomes. From pre-race training sessions to reunion parties and celebrations for finishers, there are so many opportunities to connect sponsors to participants organically, so be flexible and get the ideas going! One of the best ways to attract and retain sponsors is to be very thorough and transparent when it comes to explaining sponsorship levels and benefits. For instance, it’s important to outline when, where and how your sponsors will receive exposure. Will it be banners? Space on BibBoards (and if so, how many on each athlete)? Feature emails or other online promotion opportunities such as website mentions? If you make it crystal clear from the very beginning what the sponsors can expect, you are much more likely to form successful, lasting relationships. Cross-promotion works like magic, and race directors and sponsors should be taking advantage of it together. Online registration discounts, promotional photo booths, giveaways and more – there are so many ways to create extra buzz for both the event and its sponsors! Don’t neglect such opportunities, and everyone will win.